Some users reported that they cannot map a remote drive on Windows XP. This is usually caused by a Windows XP bug in handling authentication. When you map a remote drive using WebDAV, you must click on "Connect using a different username", then enter the correct username / password before you click on Finish. If you failed to do so, you must reboot your computer to retry. This is a Windows XP only issue. Please note on Windows XP, you must specify the correct username and password when mapping a remote drive. If you entered wrong info, you must reboot your computer to retry. We noticed a strange problem about WebDAV drive mapping on certain Windows 7 PCs (may affect other operating systems as well). The exact cause is unknown. It appears to be a Microsoft OS bug. Basically, if your password contains upper case characters, and when you try to map a remote drive, it might fail to log on. This only affects certain Windows 7 PCs. After changing the password to all lower case characters, this problem is solved. Thank you for your speedy response. I agree that WebDAV is not the best solution but my son-in-law, Neill, is so keen to use drive mapping. He does not hvae many files and they are all quite small but he wants them to be easily accessible from his 4 locations - 3 pubs and his home. Is it possible to set up Drive Mapping with File Manager? With the free account, you can have two concurrent webdav connections. Webdav and file manager are interconnected to the same storage system, so you have the flexibility to use both. Please view instructions on mapping a drive here: http://www.drivehq.com/mapdrive/WebDAVdrivemapping.aspx. Please let me know if you have further questions. Thank you. Update about WebDAV drive mapping on Windows XP: Automatically reconnect a WebDAV drive after reboot. 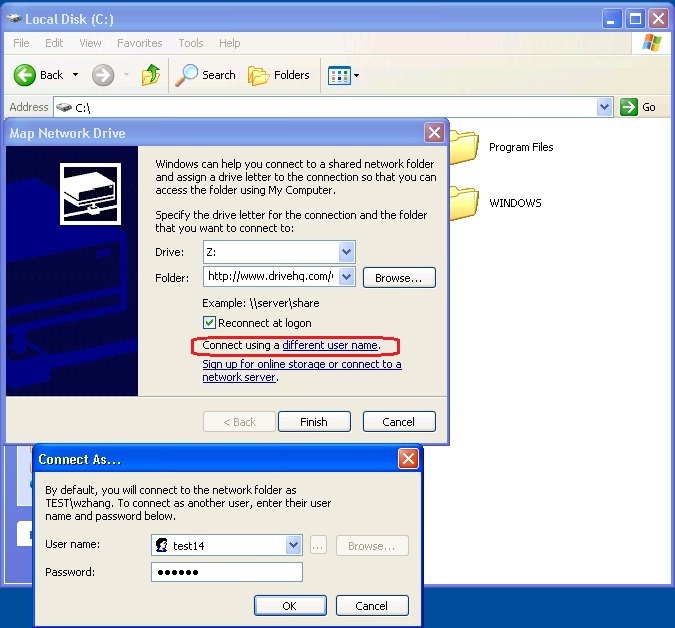 When mapping a WebDAV drive, even if you select "Reconnect at logon", Windows XP cannot successfully reconnect the WebDAV drive. When clicked on the WebDAV drive letter, it may report an error like: "An error occurred while reconnecting Drive. Web Client Network: This connection has not been restored." When this problem occurs, you have to disconnect and then remap the drive. This appears to be a Windows XP bug and not a DriveHQ WebDAV server issue. However, you can work around this problem by using a batch file. You can then reboot your computer. After you logon, it will automatically run the batch file and reconnect the webdav drive. I have the basic free account, great but I have two issues. The first, I want to share the mapping concurrently among a number of PC's, using webdav. Reading this thread I dont think this is possible, if I upgrade to a basic (1Gb) free True account will this be permitted? The second, with an XP PC, the webdav drive connected ok first time I set it up following your instructions. However, it now fails to connect, is this due to the bug described in this thread? With a free service account, you can still map drives from multiple computers. However, you are limited to two concurrent downloads. >>> The second, with an XP PC, the webdav drive connected ok first time I set it up following your instructions. However, it now fails to connect, is this due to the bug described in this thread? Most likely it is caused by XP's poor webdav implementation, esp. in the user authentication part. You can solve the problem by rebooting your computer. It is extremely easy. Just log on to the tool and you will be able to map a drive.